Will you be "left behind?” Evangelical Christianity knows this question well. It has been inundated with the pre-tribulational, pre-millennial, secret rapture of the church for the last century. To learn more, download Danny Hyde's new E-book Caught Up: 1 Thessalonians 4 and the Truth About the Rapture, available free for a limited time. The importance of Luther to the Christian faith cannot be overstated. For many today, he is probably a figure who looks larger as a symbol of defiance or a heroic rebel against a corrupt church and decadent theology. There is much truth in such images. His stand at the Diet of Worms was a remarkable act of courageous defiance. And his theology represented nothing less than a self-conscious attempt to overthrow the medieval thought which he had been taught and replace it with a comprehensive understanding of God and the gospel as refracted the incarnate and crucified Christ. In response to the Trinity debate that occured in 2016, Liam Goligher preached a series of sermons on the Trinity from Hebrews 1. This doctrine is not easy to understand or to preach. 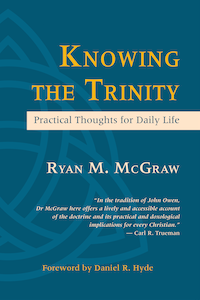 Yet the Trinity is the most foundational of all Christian beliefs, because it speaks of the God we worship as he revealed himself to finite minds. These sermons are now available on CD and MP3 at ReformedResources.org thanks to a partnership between the Alliance of Confessing Evangelicals and Tenth Presbyterian Church. Listening to them several times, one still finds new angles, new insights into the shape of this battle; new understandings of the implications for every aspect of our faith.